« The Sligo Lads Add Colour To Battlebridge! 35 comments to Are You Up For The Challenge? We really enjoyed our company outing and look forward to seeing you all again in October. Superb venue by the way! Great day! Will definitely be back! Excellent facilities. Cheers to all the lads. Fantastic day out. 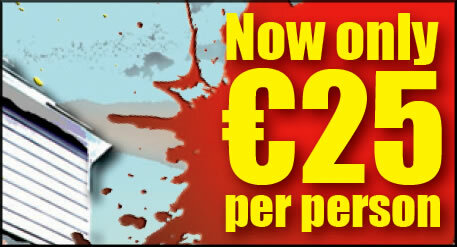 Best paintball in Ireland. We had the best time. We’ll be back and are spreading the word!! thanks for a fantastic day lads, had a brilliant time, im as stiff as a board today, all that running around like a lunatic and diving like rambo into drains and behind tyre walls just proves im not as young as i think i am. deffinatly the best paintballing experiance i have ever had and i have been to a few. a very well run opperation, freindly staff, great games and very affordable. i am definatly going to be back and will be recommending it to all my freinds. What a great day! Thanks to all the crew who looked after us all so well. We have a brilliant time and will be back!!! from Rhys and rest and the rest of us! Thanks Glenn and all the crew for a great day out last Saturday week. Well looked after and had great fun and will be back for sure. Would recommend it too anyone . Thanks to all the staff at battlebridge paintballing. Excellent time was had by all. great facilities with a lovely bunch of helpful staff. Glynn was excellent to deal with from start to finish. Fantastic weekend yet again, much more extras to hide behind this year just keeps getting better every year! looking forward to seeing the new area next year. Thanks for having us, Pints on us next year!! A huge thanks to Glen and the team in battle bridge for an amazing time and a great experience. Loved spending time there with you all was a great laugh and just made our holiday in Ireland a great holiday. An amazing gaming areas and well set out, looking forward to the 2 new gaming areas opening in the next few months so will definately be coming back when were down next. Good luck with the new zorb area and hope it works out for you all. Pints on us next year, see you all soon. Best paintball range we’ve ever played! We played 3 vs. 2 in “the village” and it was great fun!!! Extremely realistic and suitable for every game you can immagine! As I said, even 3 vs. 2 was great! I had a great time here today. It was brilliant fun,I’d recommend it to anyone and would gladly go again sometime. Our group had a superb time here last weekend. Battlebridge stands out compared to other venues we`ve been to. The variety of arenas and heplful staff make for a fantastic experience. Did paintballing here on a stag last weekend – 11 lads – absolutely great craic had by all. The variety of ‘courses’ was super and the true to life village one was surreal. Would definitely recommend this to anyone looking to kill a few hours in Carrick, stag related or otherwise. The main dude Glenn is also bang on, as are his staff. All in all a great experience. We had a group of 16 in all on one of the worst days of the year but had a ball. A must do activity, all the staf are very helpfull and Glenn will also help with food and transport afterwards. Highly reccomendable and as much fun as you can have in leitrim with your clothes on. thanks guys for a great day. thanks for every thing today battle bridge,it was the best 15th b-day i could ask for,and great experience.we had an unreal day.we did it for my birthday and i thought it was superb.they have great staff and we got on such crack with them.the places where you play battles against each other cant get better and there is better stuff coming. we will be back soon,and thats a promise. we were getting beat two nil and we had to look at our approach and the way we were trying to beat the other team,we then after a hard fight won the next two rounds ,..we went on to the finale,which with the help of the birthday boy josh ,who may i add ,never received one shot,won the game.!!!! great crk and a great experience, will be back again in the next month, should go with friends as you wont hesitate to shot probably, i went, went friends which made two teams of 7v7 which is perfect but the more you can get the better i guess, All in all a great experience. Brilliant time zorbing last weekend! Definitely recommend doing a second roll! Glen made the afternoon very entertaining and looked after us very well. Will most definitely go back!! Really enjoyed paintballing last week. Myself and a few friends went and had a great time. All the staff were really helpful and the courses were brilliant. Will definitely go back some time. had a great day paintballing yesterday ! definetally going again !!! staff were brilliant , one of them even waited for us at the end for a half hour cause we had no lift ! i a have also been to other ones around ireland and this was easily the best !!!! it feels like you are in a real gun battle ! Had the best of craic today paintballin. Will definatly b cumin bak. :) Have a few bruises but its worth it. Glen was gr8 craic. C ye soon !!!! Had an ABSOLUTELY FANTASTIC time! Soooooooooo fun!!!!!!!!!!!! I can’t wait to go back. Already planning the next trip down. Thank you for a great day out! All of us from Mohill Computer Training had a great day. It didn’t even rain. Delicious BBQ afterwards. There is talk of organising another day out!